Emilicia STYLE - A Beauty, Fashion, & Lifestyle Blog: Today I'm Wearing.. I apologise for my lack of posting yesterday - I was out most of the day and didn't get back home until late so I didn't get the chance to write anything new, but I will make up for that day today! For the moment, I'm considering taking weekends off and just writing new content from Monday-Friday, but we'll see how things go for a while before I make any set decisisons. I'm thinking, eventually, I'll start adding stuff to my queue as well, so on those days where I can't find the time to write a new post, there will already be something waiting to go up! Anyway, let's get on with today's post - really, this is what I wore yesterday, but as I'm still in bed in my pyjamas, I'll be using yesterday's outfit!! Haha. Yesterday was just a typical Saturday out shopping, so for my outfit, I chose one of my favourite shirts - it's long-sleeved so pretty appropriate for colder weather, and because of it's sheer fabric, can be worn on summery days too! 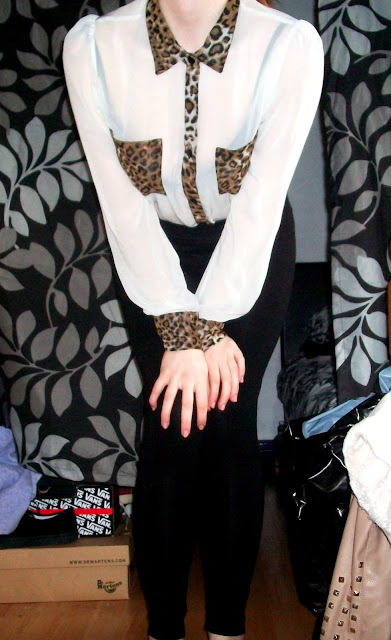 I love the leopard-print detail on it, as well - I have so many leopard print clothes I've lost count, but with the pockets at the front, the collar, and the sleeves, I think it really adds something nice to a simple white shirt! For my bottoms, I'm just wearing my basic black leggings (should be a staple-piece in every woman's wardrobe, I think) and as well as being comfy, they can be worn with pretty much everything, which is why I'm wearing them 90% of the time! I tried to do something a bit different with this outfit, however - you can probably tell these leggings aren't high-waisted, but I tried to fake that look by tucking my shirt into them and pulling them up to my waist (note to self: add high-waist leggings to wish list!). I'm also wearing my black/gold flats in this photo to show what I would normally wear with this kind of outfit - again, I'm wearing these pretty much all the time since they go with nearly everything! Haha. So you can see the collar! 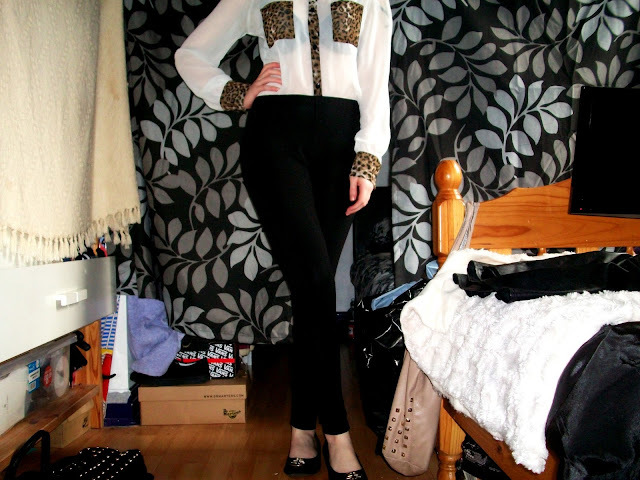 Long-Sleeved White/Leopard Print Sheer Shirt Select (I got this from Liverpool again but they do have a website). I can't remember the exact price but I think it was around £15! 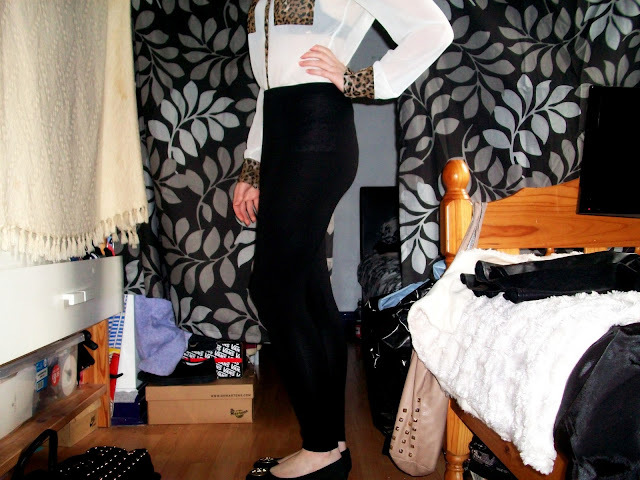 Black Full-Length Leggings Next, received as a gift so I'm not aware of the price! 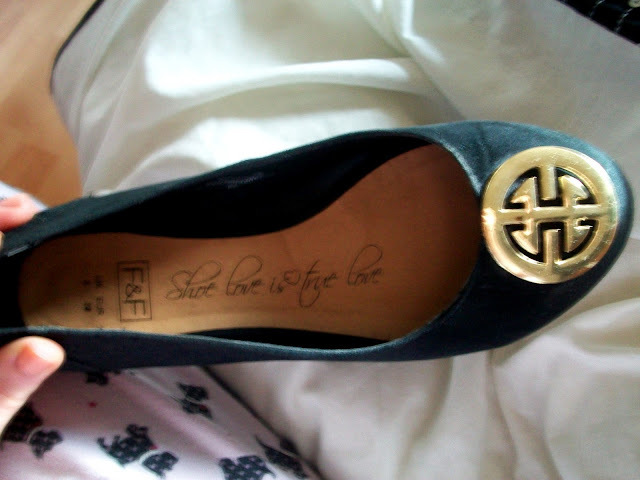 Black/Gold Pumps Tesco, £12.00 - Funny story about these shoes, last month a man on the train actually pointed out my shoes and thought they were the designer Tory Burch - the design of the gold detail on the shoe is very similar! My shoe - uncanny to Tory Berch! 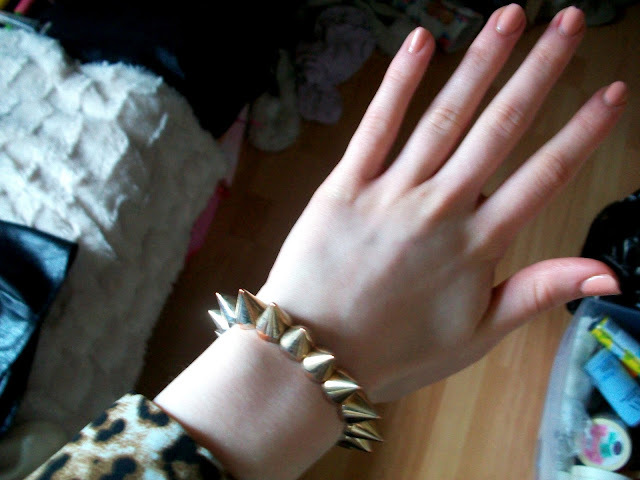 Gorgeous, yup, you guessed it - spikey/stud bracelet! I received this as a birthday present last year and it looks amazing with everything! 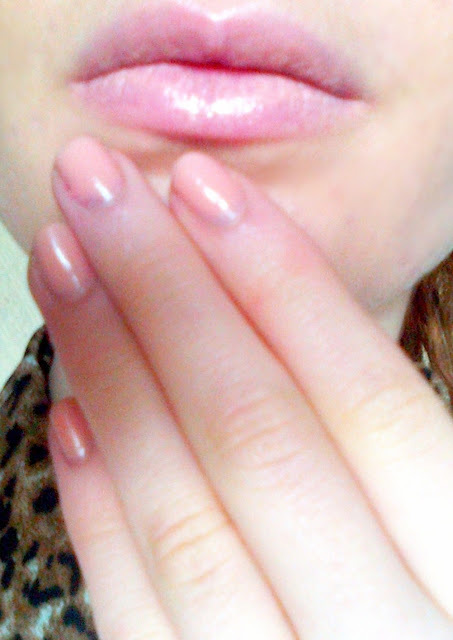 I had to include a picture of my lips for this post, too - they match my nails perfectly and look so pretty together! I will be posting a make-up tutorial for my lips soon which I will link here, and for the tutorial of my nails click here! 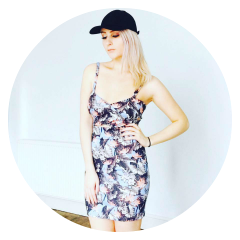 Hope you like today's post and outfit - let me know what you think! Lovely outfit, those shoes really do look like the Tory Burch flats. Thank you! And I know, I'm really glad I got them shoes - such a good price for what looks like a designer item! Aww thank you maria - of course I will! 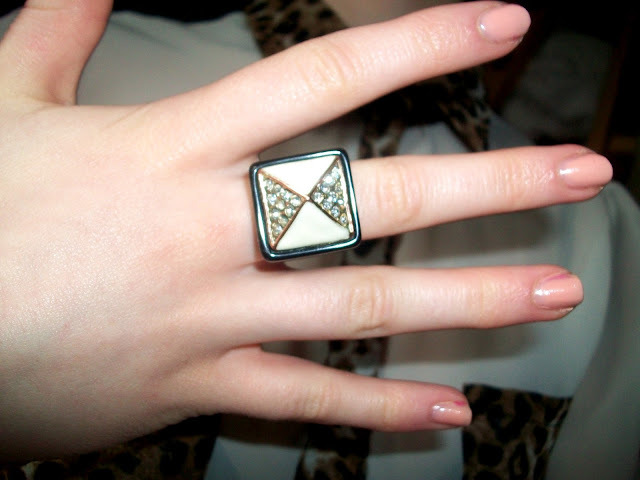 Love the ring and lip color! And thanks for commenting - have a lovely day! IN LOVE with that top. Looks amazing!